On Monday, May 16th for one night only, Michael Jurick in collaboration with Harriette Rose Katz's elite event collective, The Chosen Few, presented Infrared, a compelling series of photographs by Michael Jurick. Introduced a personal body of work created over the last four years, Jurick’s imagery showcased sweeping natural vistas and poignant moments revealed through his mastery of infrared photography. Jurick's incredible images showcase his deft skill with infrared technology, capturing nuances and notes rarely achieved within the medium. A consummate explorer, Jurick’s photographs document his adventures including the great American West and his own backyard of New York City. Natural scenes loom over the viewer and remind us of our insignificance in the face of nature’s unfathomable power and grand scale. Behind his lens, Central Park becomes a white canvas of snow that may never melt in Bethesda Fountain, the familiar bustle and grit of the city magically erased. “Study history and make it better” is a personal mantra that guides Jurick’s eclectic visual and art historical influences. In his photograph Albania Houses, buildings are stacked atop of each other along the Albanian river in Berat; the sharp angles echo Cezanne’s geometric landscapes and the Cubist’s exploration of space. A visit to Dali’s home in 1990 was a formative event for Jurick and Dali’s unsettling compositions opened his mind to art’s ability to create alternate realities. Similarly, Jurick’s infrared world turns blue skies dramatically black and nature’s explosive colors are surreally rendered in unnaturally sharp contrasts, creating a beautiful dream-like reality. Over 200 stylish guests including Bravo's Real Housewives of New York star Aviva Drescher and Secrets and Wives' Liza Sandler and Gail Greenberg were on hand to admire Jurick's photographs and the multimedia pieces, which were complimented by the perfect glow created by Chosen Few's Frost Lighting. Guests enjoyed music by Chosen Few member Total Entertainment, as they nibbled on light bites from Matt Miller Events all while taking in the breathtaking views of the New York City. The exhibition showcased 12 photographs by Michael Jurick along with seven collaborative experiential artworks created by a selection of The Chosen Few members including Frank Alexander, Jennifer Gould of Diana Gould, Ltd., Pat James & Glenn Jacinto, Jen Stone & Marco Olmi, DeJuan Stroud, Anthony Taccetta, and designer Beth Banker. 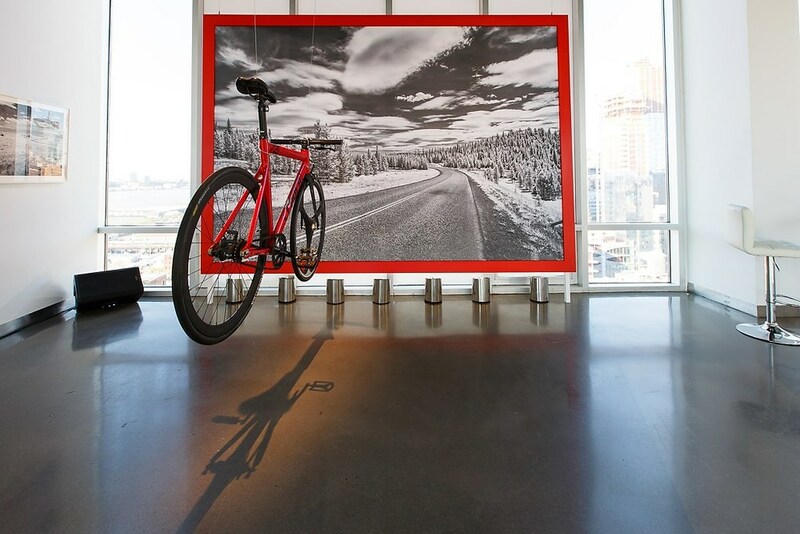 In the piece Morning Ride, Anthony Taccetta presented guests with the illusion of a bicycle speeding off into the photograph. In "Reflection" Excelsior Geyser, Frank Alexander, translated an image of a geyser at Yellowstone National Park into a geometric form echoing the rock structures in the photograph. The evening saw strong sales of Michael Jurick’s photographs and the collaborative art pieces with a number of works being placed in important art collections including two pieces acquired by Manhattan art adviser Sandy Heller of the Heller Group LLC. Towards the end of the night, Harriette Rose Katz, President & Founder of The Chosen Few and Gourmet Advisory Services, thanked everyone for coming including her daughter Melissa Rosenbloom, nieces Claudia Warner and Trisha Stern and the entire Gourmet Advisory and Chosen Few teams. She stated, "This is a room filled with people from the most creative corners of New York City and how did we all end up here…The Chosen Few. I created this highly selective organization in order to recognize the best of the best in each category in the events world." She continued, "Michael Jurick, one of the most talented and lovely photographers I have ever had the pleasure of working within my career, came to my house last summer to show me his infrared photography and I was totally blown away." Michael then took to the floor to say, "Infrared is invisible, radiant energy. Radiant is the key word in that definition. To radiate joy, to radiate love and to radiate creativity permeates all that I do." He continued, "At the second annual induction to The Chosen Few I had a vision to collaborate with the most talented designers in New York, so we could interpret these never before seen photographs with a touch of color and concept." Michael Jurick’s interest in photography began while studying art history at Tulane University in New Orleans. The vibrant and visually rich city became the backdrop for his first images and from there he embarked on a lifelong passion with the camera. Jurick translated this into a successful career in commercial photography and is known as New York City's finest event and family photographer. Hamptons friends - please join Michael for the opening reception at the Southampton Arts Center for #EastEndCollected2, featuring a number of Michael's fine art photographs along side an amazing collection of artists curated by Paton Miller. This Saturday May 7, 5pm - 7pm. Gallery Hours: Thursdays – Sundays | 12:00 – 5:00 p.m.
East End Collected2 reflects Paton Miller’s vision of this area as an ideal environment for artists to create work. Through this exhibition, Miller celebrates the community of artists; honors the collectors who have supported it; and marks Southampton Arts Center as a home where the East End arts scene can continue to thrive.